Troy, Mich., November 16, 2016 – Champion Home Builders has been honored with multiple NAHB Jerry Rouleau Awards for Excellence in Home Design including two projects produced out of its Weiser, Idaho, facility. 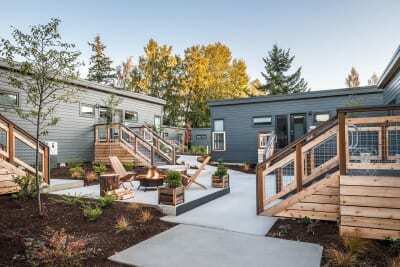 The Lodges on Vashon Island, in Washington’s Puget Sound, topped the “Multi-family” category and Snake River Cabin, in Jackson Hole, Wyoming, received the highest honor in the “Modular Home Less than 2,000 SF” category. The two developments have more in common than their awards and modular manufacturing roots, though. Both were planned so they fit within the character of their respective natural surroundings. The Lodges on Vashon were constructed, and their landscape carefully designed, to maintain the natural elements of the Vashon Island experience. Guests can even experience the surroundings through fully glazed shower doors at certain lodging units. The Lodges have proven so popular that some reservations are made years in advance. 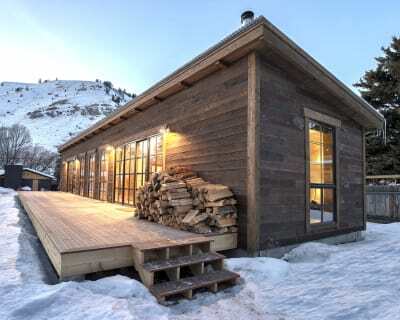 The Snake River Cabin features an open and bright living space utilizing a shed roof design with tall exterior walls and expansive glass for a spectacular view of the outdoors from one end of the cabin to the other. Other cabin features include high-end amenities such as Anderson® windows, black granite countertops and solid wood passage doors. Scott Shapiro of Seattle’s Eagle Rock Ventures, the developer/owner of the Lodges on Vashon Island, worked with Champion to bring this project to the island. The Building Systems Councils' Jerry Rouleau Awards for Excellence in Marketing and Home Design were announced recently at the 2016 Building Systems Housing Summit in Asheville, North Carolina. Founded in 1953, Champion specializes in a wide variety of manufactured and modular homes, park model RVs, and modular buildings for the multi-family, hospitality, senior and workforce housing sectors. Champion started as a single manufacturing facility in rural Michigan and grew to offer factory-built housing and other structures throughout the U.S., U.K. and western Canada. The company operates 28 manufacturing facilities throughout North America and Europe, and employs more than 4,200 people worldwide.